Philosophy 5 Edition Can philosophy be fun? 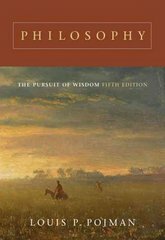 With PHILOSOPHY: THE PURSUIT OF WISDOM it most certainly is. Because of its lively writing style and clear presentation, this introduction to philosophy textbook is both interesting and informative. You'll discover all the major philosophical theories, as well as tackle hot topics like the existence of God, the free will/determinism debate, and the meaning of life.